The S-DJ50X active reference speakers are designed for great audio feedback while practicing DJing skills. The speakers which are also offered in white (S-DJ50X-W) feature excellent sound quality, improved bass response and reliability, three types of inputs, and built-in equalization, useful for DJs who want to achieve the highest accuracy in sound reproduction. Each speaker sold separately. For maximum audio performance, increased bass output and reduced unwanted resonance, each speaker utilizes a highly rigid medium density fibre-board (MDF) for the construction of its enclosure and bass reflex ducts. 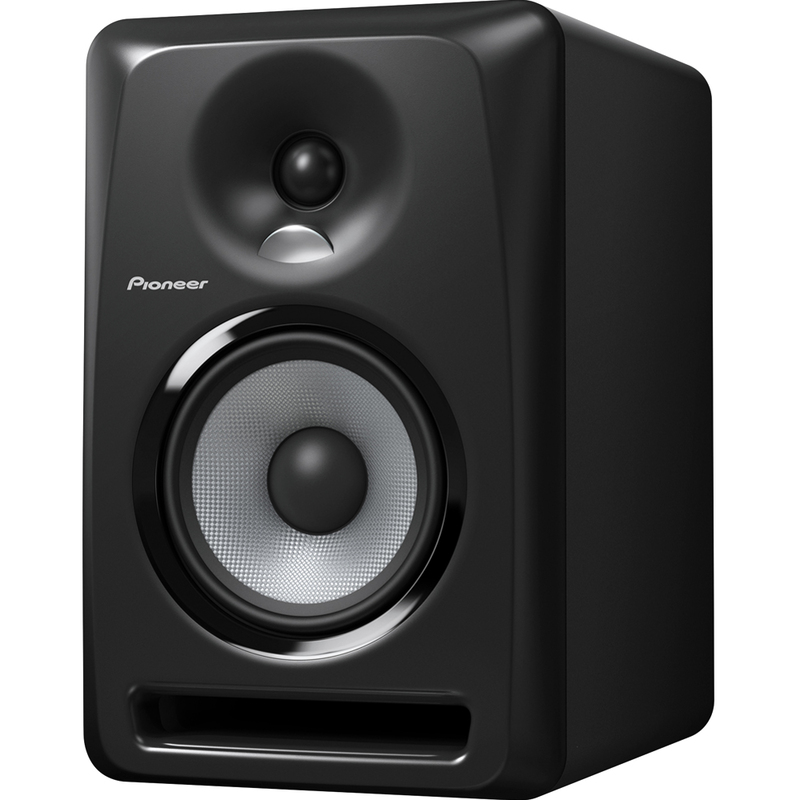 Additionally, to optimize sound quality and increase reliability, Pioneer uses woofers made with aramid fibre cones and soft dome tweeters infused in magnetic fluid. 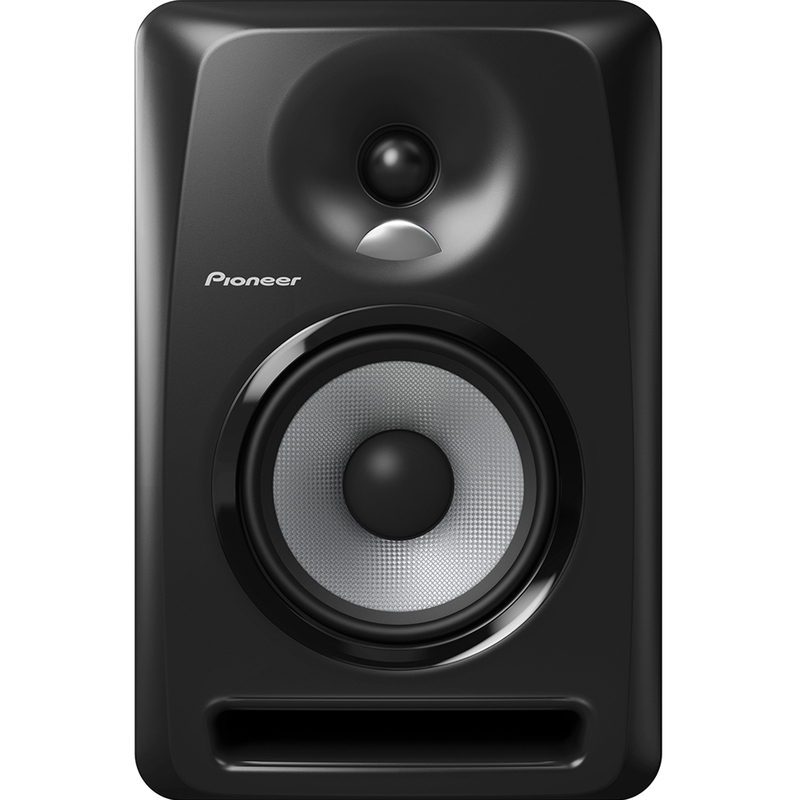 Groove Technology: To improve airflow through the port of the enclosure, Pioneer engineered the port hole with grooves to help direct the sound waves smoothly. The technique decreases standing waves from the mouth of the port, resulting in smooth bass and mid-bass output, with more impact. Convex Diffuser: Matching the bass output of the speakers, the soft dome tweeters are set in the center of a convex diffuser optimizing output and dispersing the sound energy in both left and right directions for wider imaging. The blue area below shows the normal spread of sound, and the orange area displays the enhanced spread of sound with the diffuser. For a cool cosmetic look, the diffuser also illuminates in white when the speakers are powered on. EQ Controls: The speakers also enable users to adjust high-pass level output via the built-in equalizer from the back of the speaker. The equalizer adjusts the high frequency range in one decibel increments (-2dB to +1dB), tailoring the audio output to the user's listening preference. 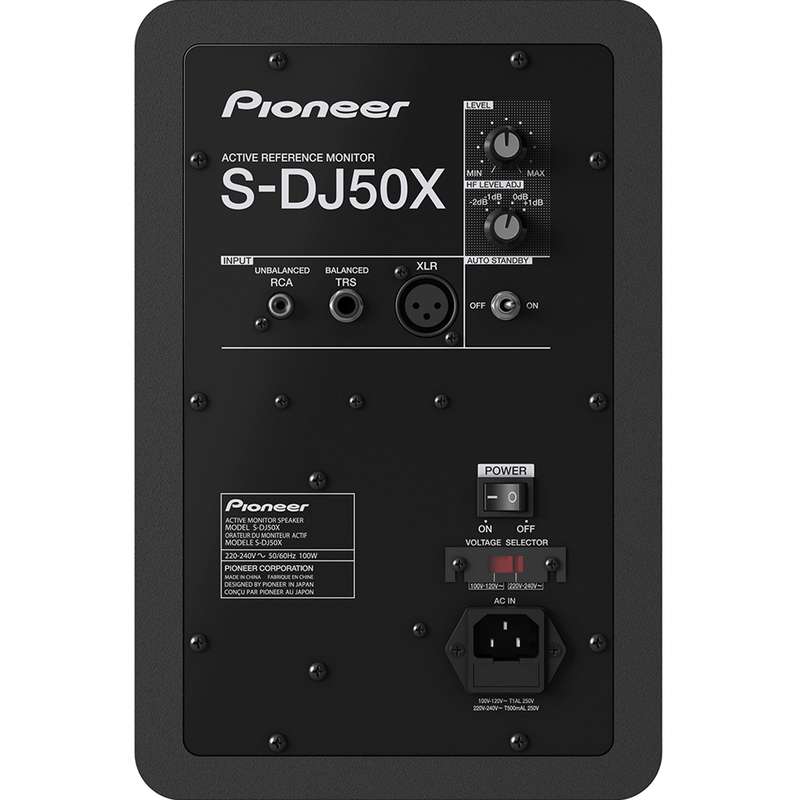 The S-DJ50X model features three types of inputs (XLR, TRS and RCA) for connection to different devices such as DJ equipment, computers, and portable devices. For convenience and power conservation, the speakers also include an Auto Standby mode that automatically turns itself off when there is no input signal sensed after 25 minutes and powers back on when signal input is detected. Equipped with a wide range of input ports (XLR, TRS phone, RCA). Features environmentally friendly “Auto Standby” mode, which reduces power consumption by switching power to stand-by if there is no input over a set period of time.